School has started again, and just like every year, we get crazy busy with school activities, sports, and other things that fill our weeknights and weekends. All of the above on top of work can put a damper on dinner preparations, leaving me scrambling some days. Lately, that’s been more often than not. On those “um” nights, I may whip out a desperation dinner of panini and salad, or leftovers from the refrigerator. If I have a few extra minutes, I’ll grab some salmon out of the freezer. 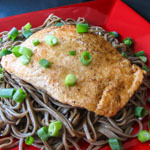 Besides the flavor and health benefits of salmon, one of the reasons it’s a favorite weeknight meal for us it’s pretty easy to prepare, and this salmon recipe from the Cooking Light archives confirms it. To prepare the salmon, all I do is rub it down with harissa then bake it in the oven while making the mango salsa. 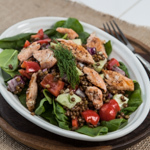 The quinoa spinach addition was my idea, which is also easy to prepare. I make the quinoa first, chopping onions and mango as it cooks, then stir the cooked quinoa in with the sautéed onions and spinach. Then I keep that warm while the salmon is in the oven, and I stir the salsa and round up the boys for dinner. My guys love this meal, and usually go back for seconds. The salmon is rubbed with harissa sauce, a spicy Moroccan condiment that you can make at home or purchase at well-stocked grocery stores. The heat of the harissa is balanced well with the mango salsa and quinoa spinach. If you make your own harissa, you can make it a week or more in advance and store it in the refrigerator. Once the harissa is prepared, the meal can be ready in about 30 minutes, depending on how quickly you can chop the mango. 2. Rinse and drain the quinoa, then cook in the 1-quart pot according to the package directions. 3. While the quinoa cooks, warm the olive oil in the nonstick skillet over medium heat. Add the red onion slices and sauté until they soften, about 5 minutes. Add the minced garlic and sauté for 1 more minute. Add the spinach and stir, then cover with the lid, cooking until the spinach wilts, about 3 to 5 minutes. Stir in the cooked quinoa, add a little sea salt to taste, then cover and keep warm. 4. Rub the harissa paste on both sides of each piece of salmon, and place on the prepared baking sheet. Sprinkle a little kosher salt on top of each, and bake in the preheated oven until the fish flakes easily, about 20 minutes. 5. While the fish bakes, stir together the chopped mango, 2 tablespoons chopped red onion, mint, and orange juice in the medium bowl and allow to rest. 6. 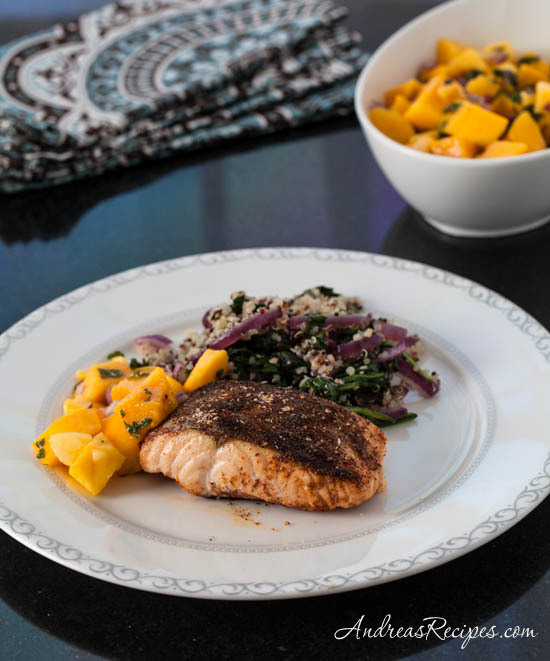 Serve each piece of salmon with the mango salsa and spinach quinoa on the side. I love the idea of rubbing harissa on salmon – always looking for new ways to enjoy this heart healthy fish. Thanks Jeanette! 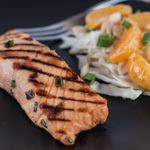 Your Roasted Chili Orange Salmon caught my eye, another easy salmon dish!